Honey lime chicken, it’s what’s for dinner. Or it was yesterday. I’m all about easy one pan or pot recipes that call for few ingredients. I’m also about delicious, tasty meals. 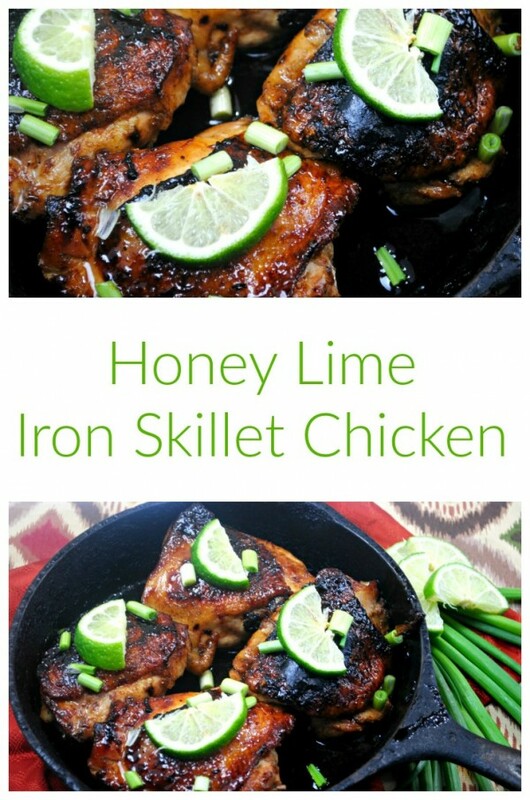 That’s why I love this honey lime chicken iron skillet recipe… it’s so good! 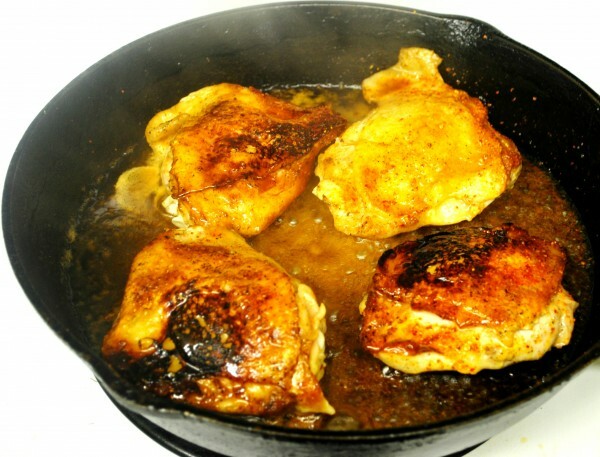 I’ve been looking for chicken recipes, since it’s one meat that my whole family loves and will eat, that I can also make in my cast iron skillet. I’ve been trying to do chicken in different ways that call for 4-5 ingredients. Recipes that are cheap, easy, but most importantly tastes delicious. The combination of honey and lime together is perfect and a flavor combination my family enjoys. 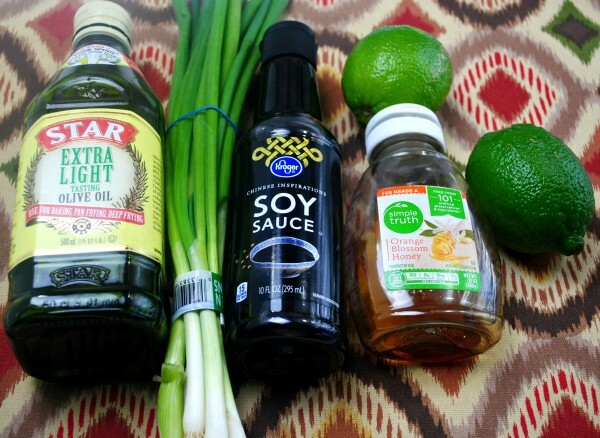 In a small bowl add your lime juice, honey, soy sauce and mix until combined. Place your chicken on a plate and salt the chicken thighs all over. In cast iron skillet, heat olive oil over medium heat. Add chicken thighs and cook for about 5 minutes and rotate and cook for another 5 minutes. 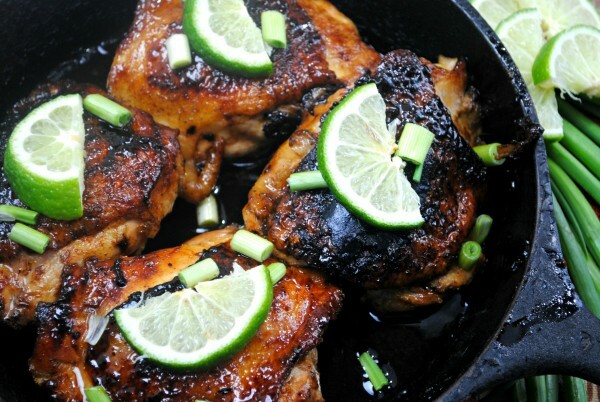 Now add your lime-honey mixture to the skillet, pouring it all over the chicken thighs. Reduce heat to low allow to simmer for 5 minutes and turn your chicken so the sauce is on all sides. Cook your chicken thighs for 20 minutes with it being covered on low. Turning the thighs at the 10 minute mark to evenly distribute the juices. Top with diced green onions and serve with lime slices. 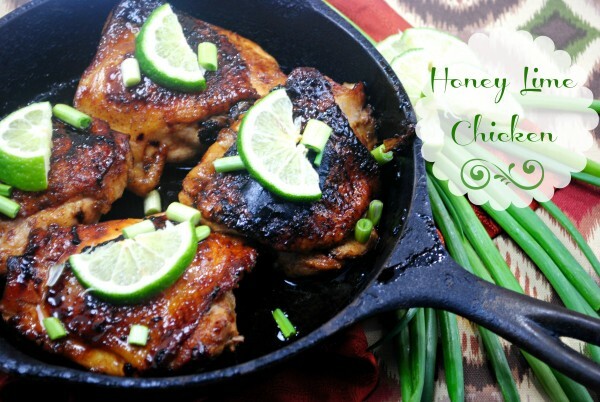 This honey lime chicken recipe gives you the sweetness of honey and the zing of lime, the perfect marriage of flavors to bring chicken to life. Boring chicken recipes will be a thing of the past… plus there’s something so old-fashioned about cooking in a cast iron skillet, not to mention the benefits. Here’s one of my favorite Pre Seasoned Cast Iron Skillets . What’s your favorite thing to make in a cast iron skillet? Remember, if you like this post, please take the time to follow all my projects and finds here on Pinterest. 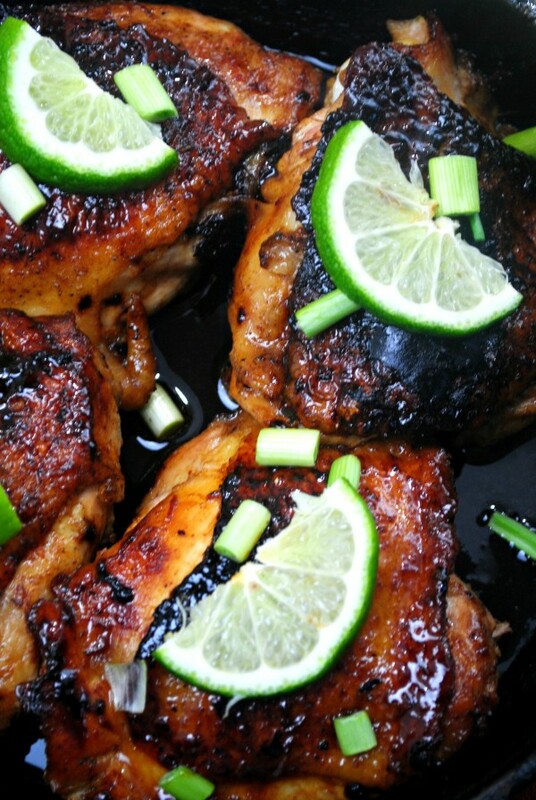 And pin this Honey Lime Chicken recipe for later. Oh my goodness Donna, this looks amazing! Thanks for sharing the recipe. Hope you’re having a great night. Well what a banner day this is for me!I have all the ingredients on hand and know what is for supper before noon.Thanks,Donna! I’m doing the low carb thing and I get so bored. This looks like a great recipe to switch things up for me. Thanks!